It's all about privacy and your own pool. This is one of St. Thomas' most romantic vacation destinations. Each residence has its own private pool. See our Pavilions and Pools Rates page. For couples who want a Caribbean villa for its personal privacy and private pool, but do want hotel services and amenities, Pavilions and Pools is the perfect choice. The 25 villas are nested into the tropical landscape, providing privacy and serenity. Fence and foliage screening between hotel villa suites affords real privacy in the pool. Each unit has its own outdoor deck space. 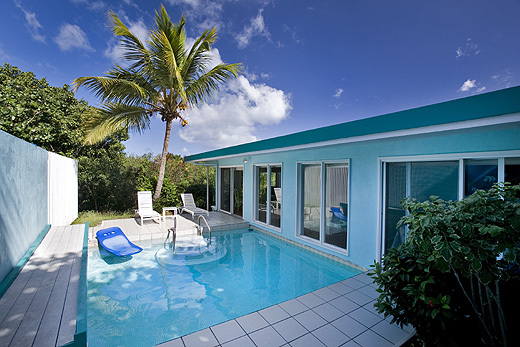 Both International and Caribbean Villa Suites have one bedroom, living/dining room and a furnished kitchen. 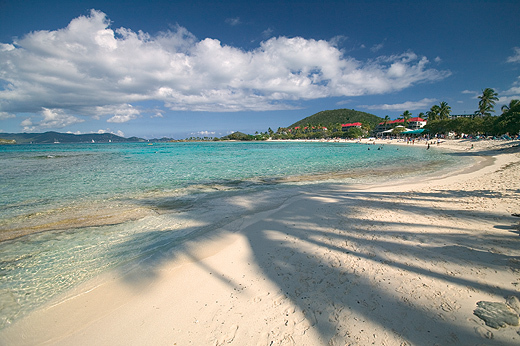 It's just a five minute stroll to Sapphire Beach, one of St. Thomas' best white-sand beaches. The town of Red Hook, where you can also catch the ferries to St. John and the British Virgin Islands, is about a five minute drive. Pavilions and Pools is not recommended for families nor children. We are designed for adult couples. Sapphire Beach, one of St. Thomas' best white-sand beaches.